Changing advanced settings may be harmful to the stability, performance, and security of the modem. Contact your local IT administrator prior to altering any of these settings. Connect the USB modem to the computer then access the Admin Web Interface. From the Networks tab, click Show Advanced Settings (lower-left). To reset the APN click Restore Default APN. 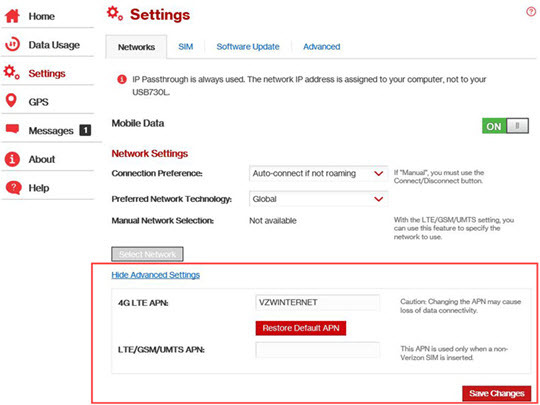 If using a non-Verizon SIM, enter the desired APN into the 'LTE/GSM/UMTS APN' field.